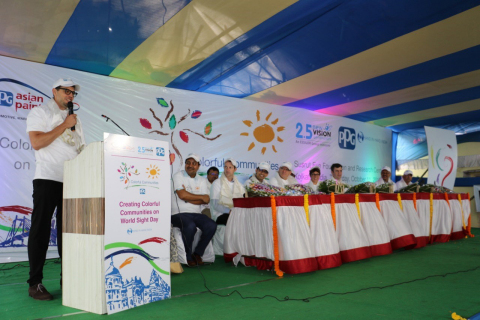 PPG (NYSE:PPG) and Essilor International today announced the launch of a COLORFUL COMMUNITIES™ project in Kolkata, India, that will help revitalize the Susrut Eye Foundation and Research Centre. The Colorful Communities program provides PPG volunteers and products along with financial contributions to bring color and vitality to communities where the company operates around the world, such as in India, where PPG has manufacturing and administrative operations. Susrut Eye Foundation and Research Centre is a non-profit organization that provides eye care community services to all individuals regardless of socio-economic background. Since its founding in 1998, Susrut has seen more than 3.5 million patients and trained more than 40,000 vision professionals. Hand In Hand India supported two previous Colorful Communities projects in 2016 and 2017 in India on behalf of PPG. The world’s leading ophthalmic optics company, Essilor designs, manufactures and markets a wide range of lenses to correct and protect eyesight. Its mission is to improve lives by improving sight. In 2013, it created a dedicated division to bring vision care to the 2.5 billion people living with uncorrected poor vision by creating access and raising awareness. These efforts comprise inclusive business 2.5 New Vision Generation, strategic giving, raising awareness and advocacy. By the end of 2020, it will have trained 25,000 primary vision care providers and provided vision care to 50 million people at the base of the pyramid. PPG Asian Paints Pvt Ltd is a 50:50 joint venture between PPG and Asian Paints Ltd, India’s largest producer of paints and coatings. Incorporated in February 1997, PPG Asian Paints offers a better value through closely tailoring its offerings to customer requirements and providing superior service. Today, PPG Asian Paints is a leading supplier of paints and coatings in diverse markets, such as automotive original equipment manufacturer (OEM), automotive refinishes, industrial, marine and packaging.